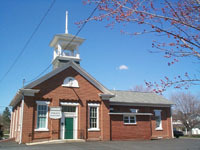 The Riverside Borough Office is in the Municipal Building located at 301 Dewart Street. It contains the offices of the Borough Secretary, Mayor, Council Chambers, Emergency Management and maintained to keep that appearance. Adjacent to the building is our town park with a picnic pavilion, picnic tables, a tennis court, a basketball court and a play area designed for younger children. Use of the pavilion is free and is open to the public on a first come, first served basis. Riverside is governed by a Mayor and seven (7) Council members that are elected by its residents and serve without pay. The Mayor, who is elected every four (4) years, is the head of the Police Department and he/she may attend and participate in all council meetings, but only votes in case of a tie vote by council. Council members are also elected to four (4) year terms, however their terms are staggered. Council is vested with the legislative powers of the Borough which includes establishing municipality policy, enacting local ordinances, adopting the annual budget, establishing the tax rate and appointing some Borough officials among other things. Due to an absence of a sewer authority, Council also sets sewer rates on the public sewer system.